Good gravy, have you all seen the cover that the good people from the Journal of Lowered Expectations known as the National Review have put together? Courtesy of Talking Points Memo's Brian Beutler, BEHOLD! Yes. 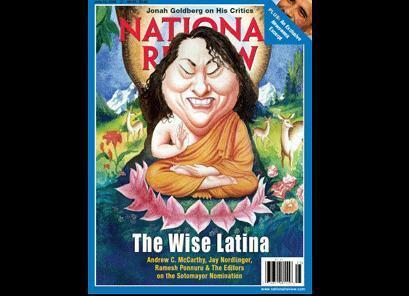 It seems that the National Review has confused their ethnic stereotypes, or their religions, or maybe they just wanted some sort of two-fer, because their "Wise Latina" cover story presents Sotomayor as an Asian, in some sort of Buddhist pose. Anyway, the good news is this will surely provide a excellent P.R. opportunity to Puerto Rico's little talked-about Buddhist community.